Approximately 120 IT personnel including 15 Scrum teams. 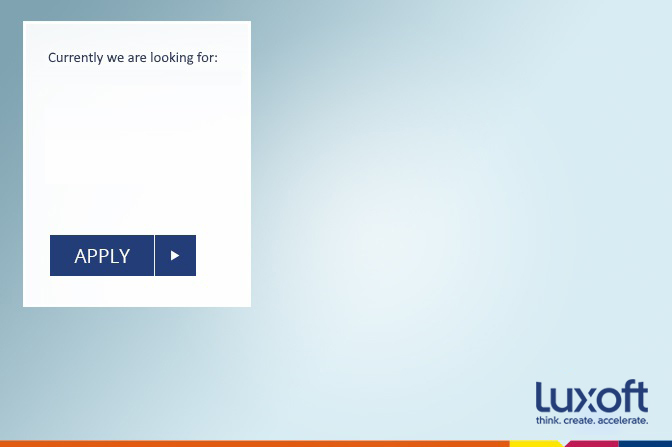 Luxoft provides 7 teams and 2 on-site employees including a Portfolio Manager. Delivery is done by self-organized cross-functional teams; each of them consists of a Business Analyst, five developers who sit together in the same room and interact on a daily basis. Each team responsible for end-to-end, starting from high-level requirements clarification and finishing by release build preparation. We aim to hire the best people and give them maximum autonomy for realizing their potential and growing technically/professionally. Competence, collaboration and continuous improvement are highly supported on program level, to create a culture where each individual can grow in their desired direction. Also there is agreement with our customers about spending 10% of everybody's time for non-delivery activities (as a contribution to the greater good of the platform and department). Our working model provides opportunity for everybody to take part in making technical/architectural decisions. We don't hire manual testers in teams and we don't have manual testing as separate development stage. In daily work we automate as much as possible. We are disciplined when write code, follow pair-programming and TDD practices, use several levels of testing (unit, integration and functional). This allows us to keep quality at a higher level, have frequent releases, get continuous feedback after each commit, reduce amount of bugs and don't have post-release support phase. Occasional business trips to UK, active participation in distributed agile process.